I drank more than usual during the months of November and December.There was Thanksgiving, Christmas, a few parties, and my birthday thrown in there. Good friends wanted to get together, laugh, trade stories, and this always seemed to included a drink or two. To be clear, I’m not talking about binging, beer pong (what is that, anyway? ), slurred words or hungover mornings. I’m not sure whether this is a good thing or not, but I’m kind of a pro at drinking. I know how much is enough and I always stop there. I learned this through years of diligent study during my 20’s. Thank god I lived through that decade without Instagram or Facebook, although I’m sure there are more than a few incriminating polaroids floating around junk drawers on the east coast. Anyway, I learned my lessons and now I’m a very responsible social drinker, IMHO. Which would be fine, except that eventually kids came into the picture, staring at me with their giant eyeballs that say “teach me how to live,” and made me take a good hard look at one of my life’s simple pleasures. Having grown up the child of an alcoholic, I am aware of how a parent’s heavy drinking can erode a kid’s sense of reality. You feel scared but you’re not sure why. Other adults say they love you and yet no one protects you. You have to be the parent of your parent— wtf? Or, you pretend everything is normal, only, since you have no idea what normal is, you get it from The Partridge Family and Love American Style. Except for the go-go boots and tambourine playing, I wouldn’t recommend it as a blueprint for happiness. So when I had kids, I was going to do different. (Can I hear an amen!?) And I have succeeded in many ways, including the fact that, unlike my mother, I am not an alcoholic. I’m not even what I would consider a heavy drinker, but I am a drinker*. Which brings me back to the kids. Those little people who, all too soon, will be offered a drink (or several) at a party and will or won’t say yes. They will or won’t have the genetic predisposition to alcoholism that seems to run in my family. They will or won’t down a few and get behind the wheel of a car. They will or won’t make the kind of stupid choices that are scattered, like mines, through the trippy land of adolescence. I dodged a hundred of them as a teen and young adult, so I know they are there, but I can’t for the life of me (or my kids) say where. Maybe, instead of looking down the road for trouble, I should take a peek at my own cozy little life. At Christmas, we had some people over to our house. There were kids and adults, a good mix. It was a fun night. Over the course of several hours I had some wine, not too much, but more than I would have if I was out at dinner or a bar, since I didn’t have to go anywhere. Late in the evening a few friends left with their kids, to drive home. I had heard a conversation between a couple, in which they confirmed who was driving, and vaguely noticed that the designated driver stopped drinking quite a while before they left. Looking back, I really do believe that everyone holding car keys was sober, but at the time it didn’t occur to me to ask. It didn’t even occur to me to ask. I don’t remember the last time I asked a friend if they were ok to drive. It just never comes up. 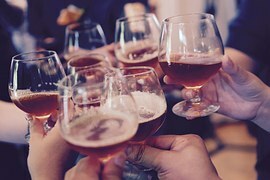 Maybe, with our partying days in the distant past, a big night out now consisting of dinner, a couple of drinks and home by nine-thirty, we assume we’ve crossed some imaginary finish line and can avoid those awkward conversations. Now it’s civilized, fun, and we’re grown-ups, for god’s sake. In other word, we got this. Which is exactly what happened that night at my house. But it turns out that there was one person there, a twelve year old kid I love and have known since he entered the world, who, I learned only later, wasn’t so cool with it. He wondered about riding in a car with adults who he knew had had a drink, but hadn’t said anything at the time. It took that, my friends, to get me thinking. I remembered how often I felt afraid, riding home from a party with my mother, after she’d been drinking all evening. I remember grown-ups who professed to love me, bundling me up with a kiss and instructions to “keep her talking,” as she weaved her way down the driveway. That night at our house, I didn’t see anyone drinking like that. But that doesn’t mean my young guest’s worries weren’t valid. Who knows if the person driving him home was in some small way impaired? Not me, I was eating leftover chicken wings in the kitchen, by the time they said goodnight. And even though I know it’s not unusual for kids of that age to be pretty judgy about things like drinking and smoking, I hate that it happened on what should have been my watch. Would we ever want our children to hear us have this conversation? Never. Is it the truth? Well, kinda, a little bit. Yeah. So the question is, do we reign it in for the sake of The Big Eyed Ones, or do we make like our neighbors across the pond and live la dolce vita? My friend Sophie Venable, who is full of sage advice and, by the way, no stranger to a cocktail, says she makes an effort to only drink around her young teenage daughters if it’s a special occasion. So, for example, she wouldn’t just have a beer with dinner on a Tuesday. But, if you really enjoy a good glass of wine with dinner, and you’re of legal age, what’s the big deal? I always thought that showing my kids that one can drink responsibly and demystifying the whole thing was a positive approach. Until further notice, I’ve decided to just be more mindful of when I crack open the Malbec. I’ll learn to use Uber, or carpool more, and I’ll tell my kids why. If you come over to hang out at my house and have a few drinks (and I hope you do!) I might have one, two, none. Either way, I bet we’ll have a great time. I will meet you for a beer, or a coffee, or a hike, because our friendship is what I’m here for, and that, dear one, is never boring. Speaking from across the pond, people do drink a lot here. One big difference however, is that no one has to drive. There is plentiful public transportation and very strict DUI laws. Still, I’ve lived in three European cities, and I think there are a lot of people who go way beyond living the dolce vita. I’ve seen beer for breakfast more often than I can count, and have you seen the size of the beers? IMO, there is a LOT of alcohol dependency going on. A LOT. And certainly many people who drink more than is healthy. Of course, I am talking about central Europe, not Italy or France, where life in general is more dolce and maybe for that reason drinking is more moderate. Maybe. But anyway, what I mean to say is that Europe is really not a model for alcohol consumption, no matter how glamorous it might seem from afar. Raising a teenager here was interesting, and I’m still not sure it was for the best, though at least I knew he wouldn’t be getting in a car, and that was a good thing. I do drink, BTW, but I’m a lightweight. Can’t keep up with these people, even if I wanted to!